Dropper Rigs are the most versatile of all the kitefishing rigs and if used correctly can be adapted to fish over most bottom types. Dropper Rigs from Paul's Fishing Kites will maximise your fishing days on either the east or the west coast. Because the mainline is supported clear of the water Dropper Rigs can easily fish areas of high surf and strong longshore currents impossible to fish with any other system. Any boat fishing technique can be done from the shore with a Dropper Rig. Either fish it as supplied over clear sandy bottom types, or make a few minor changes to the terminal tackle to fish floating baits or lures on or near reef, or multiple hooks from ledger rigs. These rigs can also be used to cast out other lines from the spare dropper cord (supplied with this rig) while setting the 10 to 20 hooks from the front dropper cord. Simple release systems can be used to separate from the line being cast, such as barley sugars which take 10 minutes to release or a smaller soluble confectionary which releases after around 5 minutes. For releasing upon the strike of the fish roller trollers or kite release clips are very effective and this rig is powerful enough to do this at the same time as towing 20 hooks out. David Edlington with a fine string of snapper and gurnard taken on a big dropper rid during a kite-fishing club demonstation. Trolling is also made easy with this rig. Simply by letting out the kite and retrieving it, or by taking the reel out of the sand and walking or driving slowly up or down the beach, gives your baits or lures plenty of movement to effectively target surface feeders such as kahawai and kingfish. The many safety features of Dropper Rigs minimise any chances of kite or mainline loss. 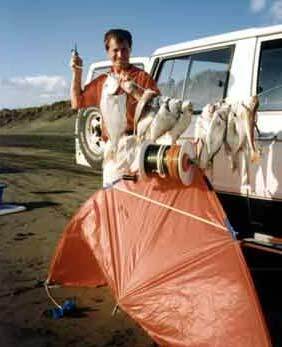 The strongest part of this rig is between the kite and the beach reel. The 65 kg kiteline and mainline are expertly tied for maximum line strength. Pre-tied 22 kg traces ensure that should a trace become fouled then only the trace will be lost. A 75 kg pre-stoppered hook section is strong enough to endure minor abrasions which may occur while setting up to 1000 metres offshore. In front of the pre-stoppered hook section is a 50 kg safety trace which ensures that should you accidentally set your gear over rocks and become hopelessly snagged then the safety trace will break and only the hook section will be lost.